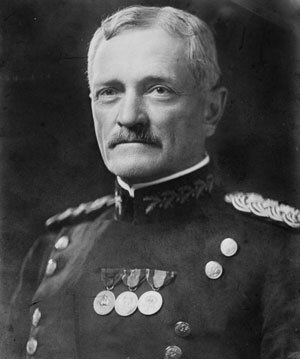 1924 Retires from active duty Education West Point. Just before World War I, there were a number of terrorist attacks on the United States forces in the Philippines by Muslim extremists. So General Pershing captured 50 terrorists and had them tied to posts for execution. He then had his men bring in two pigs and slaughter them in front of the now horrified terrorists. Muslims detest pork because they believe pigs are filthy animals. Some of them simply refuse to eat it, while others won't even touch pigs at all, nor any of their by-products. To them, eating or touching a pig, its meat, its blood, etc. is to be instantly barred from paradise (and those virgins) and doomed to hell. The soldiers then soaked their bullets in the pigs blood and proceeded to execute 49 of the terrorists by firing squad. The soldiers then dug a big hole, dumped in the terrorist's bodies and covered them in pig blood, entrails, etc. They let the 50th man go. For the next 42 years, there was not a single Muslim extremist attack anywhere in the world. General Pershing thinks water boarding is for pussies!